Hi, I'm trying to build a circuit to control some high power LEDs thru arduino. The LEDs need about 350mA, current regulated. I'd like to know if there's an IC that does current regulation (to drive the LEDs) and manages the LEDs (I have 5 of them). I know there are many, but I need about 350mA per LED and that's a lot I think.. any idea? interesting.. but it's only 1 LED on that IC, do you know if there's something similar but that drives many separate LEDs independently? 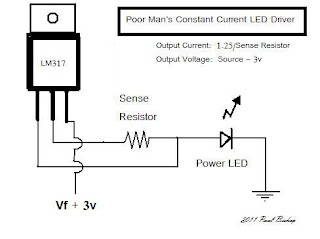 Well one driver can drive several leds if they are wired in series and the drive has an output voltage higher then the combined voltage drop of all the series leds wired in series. However if you want to control each led independently then each would require it's own constant current driver. Super cheap, super easy. Use a decent wattage resistor, 1/2 watt or more, or calc out the dissipation. The circuit isn't particularly efficient (3v drop) but it is cheap and easy! Basically the LM317 acts as a variable resistance limiting the current. The chip is rated for 1.5A, I'll say that if you are driving more than 500mA you NEED a heat sink. These are great with a 1.2 ohm sense resistor and connected to 12-14v, it's perfect for driving the 10 watt white LEDs (1A@9-12v) you can get for a buck or two on ebay. The LM317 is one of the cheapest components you can get, and one of the most useful too. Buy a pack of them, you are going to want more. This feeds into the LED, and you switch the ground connection with an NPN transistor to provide PWM. (and store them on on-chip EEPROM!!). Only one device for 5 LEDs then. It's all relative DH, after a newby is done blinking his 20ma standard leds, stepping up to a 350ma led is a 'higher power' step up in my book. It's where you have to learn about good constant current control methods and proper heatsinking and wearing sunglasses if you are going to look straight at them. I bought one and will try.. but what do you mean by "separate counters"? I know I can set the current individually using the DC (dot correction) registry in the tlc5940, so yes each pin has it's own separate current regulation I guess.. but anyway as you say currents do add, as long as the voltages are the same (and don't flickr I guess..) there shouldn't be any problem. A word of caution, while you can get the current within the rating of the chip watch out for the power dissipation running 5 350mA LEDs is going to be very close if not over the limit. There is a scary looking formular in the data sheet, that needs your circuit values plugging in. As for our Mr Heny, I don't cair what you call high power, 350mA for an LED is high power. It might not be ultra high power but it is high.